Monroe Seals has been a leading manufacturer of extruded rubber profiles and tubing for over 50 years. We specialize in high volume and one-time orders. We proudly serve the Aerospace & Defense, Agriculture, Biotech, Energy & Utilities, Healthcare & Medical, Transportation and many more industries. Materials which can be extruded include dense and sponge rubber from a variety of compounds to meet your specific environment and application. These compounds include Nitrile, EPDM, Natural rubber, Neoprene, Urethane, Silicone and many others. Extrusions can be diversified for use by many secondary operations such as cut lengths, vulcanized to be endless, and formed and notched to allow a variety of shapes and sizes of products. 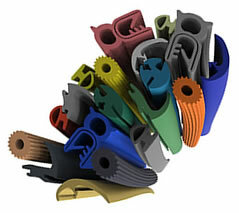 Are you looking for custom rubber extrusions?